Earlier this month USA Today published the results of an extensive and important investigation ("Broken discipline tracking systems let teachers flee troubled pasts"). Regrettably, Oklahoma was given an "F" grade for its teacher background check system. Forgery, money laundering, and embezzlement make for engaging Law & Order episodes but depressing headlines from local school districts. Sadly, school systems are not immune to bad actors. For exhibit A, see Oklahoma’s Swink school district and its auditors. An Oklahoma State Department of Education investigation found the firm of Sanders, Bledsoe, and Hewitt missed an embezzlement scheme totaling $235,000 involving district employees. Now, the FBI and U.S. Department of Education are also investigating. Cue the Law & Order theme song. School and district employee fraud and abuse has been a national phenomenon for decades. Policymakers in large systems like Los Angeles, Chicago, and New York City created investigative units for the purpose of tackling misuse. And they’ve been busy. Just last year, the former head of Chicago’s school system was indicted in a kickback scheme that stole some $23 million meant for children. Preventing those bent on misdeeds from committing crime is the stuff of science fiction. However, there are ways to limit the damage done by those who intend to steal funds meant for students. Arizona lawmakers enacted education savings accounts in 2011. With an account, the state deposits a student’s funds from an assigned school in a private account that parents use to buy educational products and services for their children. Parents can buy online classes, save for college, purchase textbooks, and pay private school tuition, to name a few—or any combination of such services. The Arizona Department of Education can track precisely how much was distributed to each account and monitors parent spending using an online system that looks much like your online checking account register. Oklahoma lawmakers have introduced similar legislation to create education savings accounts, as have policymakers in more than two dozen states. Four other states—Nevada, Florida, Tennessee, and Mississippi—have already made similar accounts available to students. According to data provided by the Arizona Auditor General, 0.17 percent of the money deposited in Arizona education savings accounts since 2011 has been misspent. During this period, $55 million has been deposited in the accounts of some 3,000 children. Department officials have limited ongoing account fraud. What explains this? Critically, state agencies make quarterly deposits in Arizona students’ accounts. Parents must complete expense forms at the end of each fiscal quarter prior to the next disbursement. If department officials find discrepancies between expense forms and the online tracking system, staff can suspend an account until all funds are accounted for. If staff uncover purposeful misuse that amounts to theft or fraud, the department can close an account. Department officials also conduct random and annual account audits to make sure taxpayers and students are protected from misuse. This means long-term misuse, like the false contracts issued by Chicago’s superintendent or altered school district checks in the Swink district, is stopped at the first sign of trouble and cannot multiply. Oklahoma lawmakers can learn from Arizona’s experience with education savings accounts. Again, while eliminating fraud is impossible, lawmakers have other tools at their disposal to prevent fraud. Nevada policymakers have already taken steps to protect students that will use the state’s education savings accounts. There, state policymakers have contracted with a private firm that processes medical claims to help with account deposits and payments. Policymakers anticipate that when parents make a purchase for their student using an education savings account, the processing firm will confirm that the transaction is legitimate before distributing funds. This dual-accounting should add yet another layer of transparency to the accounts and help make sure money meant for a child’s education is used for that purpose. Education savings accounts give parents and students a variety of learning options. The accounts also provide lawmakers with a more transparent, effective way to prevent fraudulent use of taxpayer money meant for a child’s education. Oklahoma children deserve nothing less. "Having worked in Oklahoma City public schools," Jonathan Small writes today in The Journal Record, "I’ve personally witnessed noticeable segregation. In the suburban school district where I live now, my four daughters would be among the few of African-American descent at their local public school. To empower the most vulnerable and increase racial integration, expansion of school choice is a must." A terrific editorial today in the state's largest newspaper ("Debate over ESAs is about helping Oklahoma students") reminds us that parents are also concerned about safety. Not the norm, to be sure, but it looks like a blast. Especially the poolside stuff. Great news this week, as the Oklahoma Supreme Court declared Oklahoma's special-needs voucher program, the Lindsey Nicole Henry Scholarship program, to be constitutional. The decision is here, and proves that even non-lawyers like myself can figure out a thing or two. To go deeper, listen to OCPA legal eagles Trent England and Andrew Spiropoulos discuss the ruling here and read Spiropoulos's Journal Record column here. Students and parents (especially those parents whose bullied children talked about suicide) are of course thrilled with the ruling, as are The Oklahoman, Gov. Mary Fallin, and Attorney General Scott Pruitt, who called the Henry Scholarship a "wonderful program." Oklahomans seem to agree: a Cole Hargrave Snodgrass survey released in December 2015 found that 74 percent of Oklahomans think the Henry Scholarship is a good thing for Oklahoma while only 11 percent say it's a bad thing. 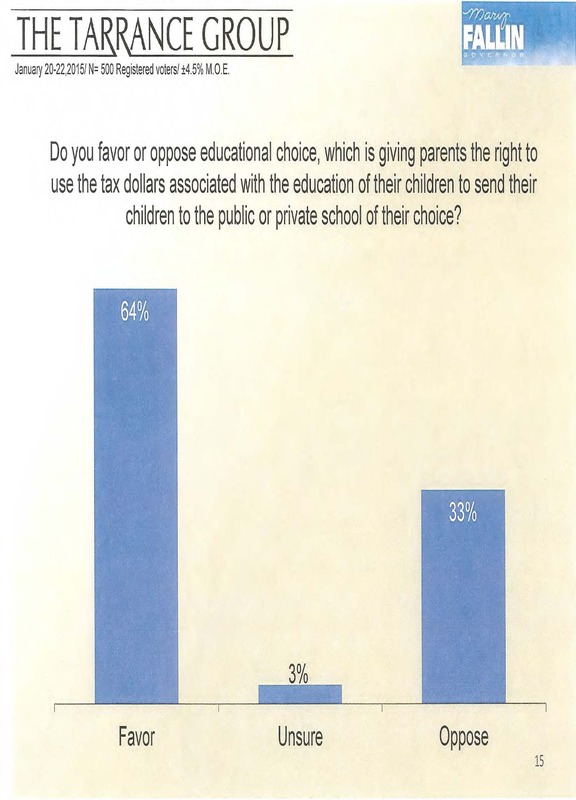 When asked if they favor or oppose expanding this opportunity to more children, 75 percent say they favor the idea while 16 percent oppose. Meanwhile, the Tulsa World, in keeping with the venerable tradition of haughty disdain for its customers, informed its readers that the "Lindsey Nicole Henry Scholarship Program was a bad idea when it was first written, and we continue to oppose it." Sand Springs superintendent Lloyd Snow, perhaps unaware that legislation passed by the people's elected representatives and signed into law by a popular two-term governor is a pretty good indicator of the will of the people, was similarly defiant: "A legal ruling does not change the will of the people." Neither the governor nor anyone connected to him asked for the bill to be named for Lindsey. Rather, as state House Speaker Pro Tem Kris Steele pointed out, "It was suggested to him as a way to honor the memory of his daughter and let it be known for generations to come that she, and her parents, are helping to improve the lives of special-needs children across the state." So as the years pass, and you hear stories of disabled kids whose lives were changed because a scholarship gave them a chance to try something new, I encourage you to think of that little girl. I know I will. "Oklahomans have already made their 'choice' when it comes to education," Edmond school board member Meredith Exline wrote in a recent column. "More than 90 percent of parents have chosen public schools." But let's think about this for a moment. Education reporter Mike Antonucci once asked: "If the government, under the force of law, takes money from my paycheck every month to supply me and every other citizen with a Yugo, and I choose not to spend additional personal income on a Chevy, am I 'choosing' the Yugo?" So a full 56 percent say they would choose a public school. That's a lot. But it's a far cry from 90 percent. Indeed, past surveys have found an even greater desire for options. When a January 2015 SoonerPoll asked parents what type of school they would select to obtain the best education for their children, 41 percent said a traditional public school, 43 percent said a private or parochial school, 8 percent said a charter school, and 7 percent said home school. On Larry King's radio show several years back, Keith Geiger, then president of the National Education Association, admonished a school-choice proponent: "Quit talking about letting kids escape." But some kids really do need to escape. Not many kids here in Edmond, perhaps. My neighbors have already made their choice, and most appear to be satisfied. But "many, many parents are not able to take their children where they want them to go to school," says Dr. Betty Mason, former superintendent of the Oklahoma City Public Schools, in the one-minute video below. "They're stuck for economic reasons." In other words, they have not truly "made their choice." I urge you to watch the brief testimonials at ESAOK.com. Many parents are in a crisis situation. These are the types of parents who would say to James Lankford, "My child doesn't have a few more years. This is my child's only shot." Folks in the public education community sometimes evince an unsettling lack of confidence in their own product. One wishes they would step forth boldly and declare, "We have absolutely nothing to fear from an ESA program!" After all, Oklahomans have already made their choice. By harnessing the market, as Jason Bedrick explains. Education Savings Account legislation cleared its first hurdle this week thanks to the committee votes of Speaker Jeff Hickman, Speaker Pro Tempore Lee Denney, Rep. Chad Caldwell, Rep. Dan Fisher, Rep. John Paul Jordan, Rep. Sally Kern, Rep. Jason Nelson, Rep. Michael Rogers, and Rep. Chuck Strohm. A vote for ESAs is a vote for public education. After all, as education researcher Greg Forster noted in his 2013 meta-analysis of the school choice literature, "twenty-three empirical studies (including all methods) have examined school choice’s impact on academic outcomes in public schools. Of these, 22 find that choice improves public schools and one finds no visible impact. No empirical study has found that choice harms public schools." Dr. Forster told me this week that the tally is now up to 27-1. School choice harms public schools? It's quite the talking point, but the empirical evidence says otherwise. Terrific column today by Archbishop Paul S. Coakley and Bishop Edward J. Slattery. KFOR has the story about her Facebook post which is going viral. "A Green Country family is suing Owasso Public Schools over an offensive comment allegedly made by a principal," FOX 23 reports. "Owasso Mid-High School principal Don Huggins is accused of telling two students with cerebral palsy that 'all the cripples are getting out early' as they left the school." Patrick McGuigan, a member of the Oklahoma Journalism Hall of Fame who has been writing about school choice for four decades, has a helpful new analysis here. "At a time when the state badly needs to save money," economist Byron Schlomach writes today in The Oklahoman, "the time is ripe for consolidating school districts. Right?" Wrong, he says. If we want to save kids and save money, we should concentrate our efforts on passing school choice measures like Education Savings Accounts to let children escape bad schools. And we should consider breaking up the megadistricts that spend too little on instruction and where the bulk of the F-rated schools are. MiddleGround News has the story. "In any business or government service, continued investment can only be justified by results," retired Oklahoma National Guard brigadier general Ed Wheeler writes in the Tulsa World. "Conventional wisdom concedes that public school teachers are not paid enough for what is expected from them. Yet the same public that sympathizes with those teachers, never seem to ask what is reasonable to expect for their investments." As an adjunct instructor, I taught college for 13 years. Of almost 2,000 students who came from dozens of states and school districts, I was stunned by one undeniable fact: The overwhelming majority of freshman students who arrived in my classes less than three months after graduating from high school were abysmally ignorant and unprepared for college work. Many of them couldn’t spell, formulate a coherent sentence or create a simple math equation in their heads. When required to write a simple assignment, their grasp of grammar was elementary at best. They didn’t know the difference between an adjective and a noun. Too many didn’t know the difference between plural and possessive words, and they felt I was unfair by pointing out that there, they’re and their had entirely different meanings, even though their electronic crutches used them interchangeably. They often lacked the skills to take notes during lectures and class discussions, a condition that will inevitably worsen since cursive is no longer being taught in many elementary schools. Their grasp of geography was parochial at best. The overwhelming majority could not identify the 50 states of the union on a map. It is impossible to teach anyone about the Battle of Gettysburg if they don’t know where Pennsylvania is, or anything about our government when they can’t even name the vice president. "We should give up on the idea that the state education establishment will force excellence on local schools. Instead, we must encourage districts, schools, and families to mount their own efforts to foster excellence," OCPA distinguished fellow Andrew Spiropoulos writes today in The Journal Record. If the state wants to help, it can free local districts from disabling mandates and regulations, authorize a variety of institutions, including cities, to create new charter schools, and truly empower families by establishing education savings accounts. State bureaucrats aren’t responsible for the education of our children – parents are. Penny Ridenour asks the question over at Red Dirt Report. "To satisfy the popular demand for traditional education," law professor Andrew Spiropoulos tells journalist Patrick McGuigan, "I cannot think of any public policy that has as good a chance to stem the tide of cultural decay than ESAs." Spiropolous says ESAs bring "empowerment of those without great resources. In times of economic strain especially, ESAs are easy to understand. Thousands of dollars that would otherwise be spent contrary to your values can be spent in ways that support those values." Public schools across the nation are forcing Islamic indoctrination, Investor's Business Daily recently editorialized. Project Veritas recently caught on camera a former marketing executive for textbook publishing giant Pearson Education revealing the anti-Christian, pro-Islamic agenda of Common Core. Veritas: Christianity is totally out of Common Core? Ex-Pearson official Kim Koerber: Yes, it is. Totally. It’s not a core concept at all . . . They said you have to talk about Islam. “Parents must be ever vigilant to the Islamic indoctrination of their children under the guise of teaching history and multiculturalism. This is happening in public schools across the country. And they must take action to stop it,” warned Richard Thompson, president of the Thomas More Law Center, a national public-interest law firm that filed the lawsuit on behalf of the [John K.] Wood family. If more parents fail to fight back like the courageous Wood, they risk their children not just being indoctrinated, but possibly even being converted to Islam in our otherwise secular public schools. Jay Greene reminds us (in the comments section here) that he found "significantly lower levels of anti-Semitism among adults who had attended religious schools as children compared to those who attended secular public schools." For decades, we’ve heard opponents of school choice claim that the government school monopoly is our only protection against “jihad schools” that will teach children to hate and kill. In all that time, you know what we haven’t seen? Jihad schools, operating in any of the nation’s 59 private school choice programs across 28 states. In fact, the government school monopoly doesn't protect us from religious division, and it can't do so. In the years after 9/11, there was a scare about “madrassas”—Islamic religious schools. A vast international network of schools funded by Saudi money, we were told, was brainwashing a new generation of Muslim children into our violent enemies. Something—it was never clear what—had to be done. Well, there are plenty of Muslims who are our violent enemies, but it turned out there was no evidence madrassas had anything to do with it. In fact, a study by Peter Bergen found that Islamic terrorists were actually much less likely to come from madrasas than from other kinds of schools. Bergen also pointed out that none of the 9/11 pilots or secondary conspirators went to Islamic schools. Which is why you haven't heard anything about madrassas lately. Unfortunately, this country has a long history of that kind of hysteria when it comes to private schools. The old fear campaigns against Catholic schools have become today’s fear campaigns against Muslim schools—often as a cover-up for what are really anti-Catholic and anti-evangelical bigotries. In the early 20th century, with support from the Ku Klux Klan and other anti-immigrant groups, Oregon outlawed private schooling. It argued that the filthy popery of private schools threatened to contaminate the purity of our precious cultural unity. In Pierce v. Society of Sisters (1925), the Supreme Court struck down that law and affirmed the right to private schooling. However, even in taking that wise action, the Court was not immune to cultural hysteria. Looking more at the hypothetical fancies of the Klan than at the behavior of private schools in the real world, the Pierce court affirmed the concerns behind the law it was striking down. It granted states sweeping power to compel private schools to teach religious tolerance, the rule of law and respect for the U.S. Constitution. Today, all 50 states have laws requiring private schools—whether they participate in school choice programs or not!—to teach children respect for these American values and institutions. Although the historic origin of these laws is in bigoted hysteria, and many of the laws are sloppily drafted, I’m still glad to have them on the books. Even if they’re “only” symbolic, they symbolize our insistence—stretching back through the American founders all the way to John Locke—that citizens have a public and (in principle) enforceable responsibility to support the rule of law and religious freedom. As Justice Robert Jackson said, dissenting from a 1949 Supreme Court decision which held that fascist anti-Semite Arthur Terminiello was exercising free speech rights when he incited a violent riot in Chicago: The Constitution is not a suicide pact. But these laws have never been needed, because American private schools have always been eager to teach religious tolerance, the rule of law, and respect for the U.S. Constitution. Education scholar Pat Wolf reviewed a large body of U.S. studies and found a consensus that private schools are actually more effective than public schools in teaching tolerance for the rights of others, as well as other civic values and practices essential to democracy and pluralism. My review of studies looking particularly at school choice programs found the same. Cultural integrity is a legitimate concern. But dealing with it the right way, with respect for religious diversity, is hard and painful work. The cowardly and the infantile want instant gratification. There is, however, another factor at work. In the face of religious pluralism, many people adopt the view that only a deliberately secularized institution can be trusted to maintain tolerance and diversity. Religious institutions are obviously partisan among beliefs. So institutions are rigorously secularized in hopes that this will make them neutral. In fact, it does the opposite. Deliberately secularized organizations have to stigmatize and exclude religious concerns from their shared life in order to maintain their secular identity; this marginalizes and alienates religious people. As Wolf’s evidence shows, it is not empirically true that secular schools produce tolerant and democratic citizens. They are actually more likely than religious schools to produce people who don’t respect the rights of others. This is because a secular institution can tell you to be good (be tolerant, respect diversity, etc.) but it can’t tell you why. It can’t connect the rules of right behavior to deep sources of meaning, purpose, and identity. It ends up just spewing a lot of sentimental gas, and then wagging its finger at you if that doesn’t work, and then punishing you. Or it offers utilitarian, mercenary reasons to be good. None of that helps students form either a deep attachment to moral rules or the self-discipline to carry them out. By contrast, religious schools have proven themselves effective in producing citizens who tolerate others and respect the rule of law. School choice creates harmony by allowing all religions to participate in education on equal terms. It would be a major step forward in defusing our culture wars and preserving religious peace. "Schools participating in voucher, tax credit, and education savings account programs are held accountable by the families who choose whether to enroll their children," Michael Q. McShane writes. These families need good information to make that choice, so administering tests and making the results public is important, but private schools should not have to participate in the same regulatory scheme that governs public schools. We should never have expected a system designed to regulate a monopoly to be good at regulating a marketplace, and given that state-mandated testing regimes constrain what private schools can do, they ought to be reconsidered. The purpose of testing should be to inform the marketplace, not to impose a uniform vision of what makes a quality school. The Islamization of America proceeds apace, David Solway writes, and the education establishment is complicit. This is nothing new. Eric Buehrer has written about this for Breakpoint, and Michael Patrick Leahy has written about the parent rebellion brewing over Islam-centric educational standards. School choice in America: What does research tell us? Gerard Robinson, a resident fellow at the American Enterprise Institute (AEI), testified this week before the House Committee on Education and the Workforce. "Gov. Mary Fallin deserves high praise for the vision she demonstrated in this week’s State of the State address," OCPA distinguished fellow Andrew Spiropoulos writes today in The Journal Record. In education, the governor calls for the single reform that has the greatest chance of sparking systemic change––the establishment of education savings accounts. ESAs, by providing families with a significant portion of the state funds allocated for their children’s education, will empower parents to choose the educational services that will most benefit their children. Parents can choose to spend the funds on a variety of educational services, including private school tuition, tutoring, materials or even college tuition savings. Our state’s children will benefit because they will receive the services that best serve their needs. Our state’s public schools will benefit because, as in every other segment of the economy, the challenge of competing with other providers will foster institutional innovation and improvement. And on the CBS affiliate in Oklahoma City (at the 2:50 mark below), Patrick McGuigan discusses the ESA legislation being debated at the state capitol. "I’m 100 percent supportive of Education Savings Accounts," Gov. Mary Fallin said today in her State of the State address. "Our inner-city problems of crime, unemployment, and single motherhood have a major common cause — the requirement that low-income families must send their children to their designated neighborhood school, no matter how bad and violent it is," James B. Wise writes in a letter published today in The Oklahoman. The result is generation after generation of uneducated, unemployable, and frequently violent adults who support themselves with crime or public welfare. The only solution is school choice and school competition. Every child should receive a voucher good for a year's education in any school in the state. When parents exercise choice with those vouchers, currently good schools and good new start-up schools will get the students, and bad schools will have to close. Only by school choice and school competition can we make it possible for inner-city children to become educated, employable, and therefore marriageable. Considering the massive public costs of inner-city problems, universal vouchers would be cost-effective.